This year’s Tostitos Fiesta Bowl features two teams that came up one night short of a perfect season and, if a college football playoff in any form existed, may still be in the running for this year’s national championship. However, the BCS focuses only on matching the top two teams in the nation for one game and that honor, so we should simply consider ourselves lucky to find the January 2 meeting of #3 Oklahoma State and #4 Stanford on the bowl slate for our enjoyment. Both sides of the ball are littered with NFL-level talent and coaches leading surging programs, so pairing this game with the Rose Bowl on that Monday should ring in the New Year with fireworks capable of holding us over another week before the BCS National Title game. This nightcap will feature the day’s second dose of a quick to the line offense, as Oklahoma State head coach Mike Gundy will attempt to keep his team focused on attacking the team in front of them instead of chasing the Tigers they couldn’t quite catch. The Cowboys finished the season with a historic thrashing of in-state rivals Oklahoma in their annual Bedlam matchup and had hoped to climb enough in the polls to overtake Alabama for the #2 ranking and place in the BCS title game. Strength of schedule and the computers’ favor, however, was not enough to overtake the human polls and questionable rankings from some coaches and university representatives. Instead, Oklahoma State will play host to Stanford in University of Phoenix Stadium and do their best to serve notice that the Big 12 champion deserved a spot in the title game, after all. Quarterback Brandon Weeden (34 passing TDs this year) and his reliable, award-winning wide receiver Justin Blackmon will bring their own version of a relentlessly-paced offensive to challenge Stanford. Coach Gundy, who once became notorious for his “I’m 40!” speech in defense of a previous quarterback, helped his team overcome its disappointing double-overtime loss to Iowa State in a trap game near the end of the year. Bedlam and the BCS title may have made them too nervous to maintain their first-half lead in the game, but as a win over the Sooners proved, this team will not collapse because of one loss and will represent one of the country’s toughest conferences until the very end of this college football season. Stanford, led by first-year coach David Shaw who replaced Jim Harbaugh when he left for the NFL, possesses its own top-notch quarterback in Andrew Luck. Luck, who stunned analysts when he returned for his junior season in Palo Alto, was deemed as the Heisman front-runner all season before watching Robert Griffin III claim the trophy this year. Luck is still regarded by many as the presumed #1 overall pick in the next NFL Draft and, if that’s the case, will certainly be in search of ending his college career with another notch in the win column. Despite the nation’s focus on Luck (35 passing TDs this year), Stanford’s success is founded on the talent and execution of its offensive line, running game and a cast of reliable tight ends, including Luck’s favorite target Coby Fleener. Stepfan Taylor’s mix of toughness and breakaway speed provides Luck with the support necessary to wear down defenses and keep them honest, leading to big plays off of play action and Luck’s ability to scramble. The team’s offensive line talent is matched by its defensive unit, too, which creates turnovers and has slowed down the opposition all season. The one time both Cardinal units looked subpar, however, was against Oregon. Can Stanford overcome a similar-style offense that keeps their own talented QB off of the field, or will Oklahoma State find a way to expose them in a similar manner? See for yourself in person at the 2012 Fiesta Bowl! SeatGeek offers you the convenience of seeing all of the listings from ticket sites around the country in one place with the added bonus of Deal Scores rating the value you’ll receive on an offer at any given time. Want to see these two offenses and well-regarded quarterbacks shoot it out in the desert? Then check out these facts before starting your own search for Fiesta Bowl tickets and deals! 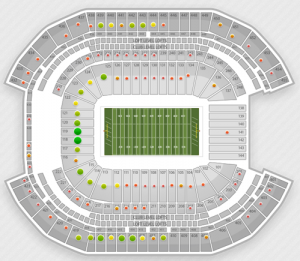 You can still get first-level end-zone seats for less than $170. Given this matchup’s high scoring potential, the game may be closer to you more than usual. 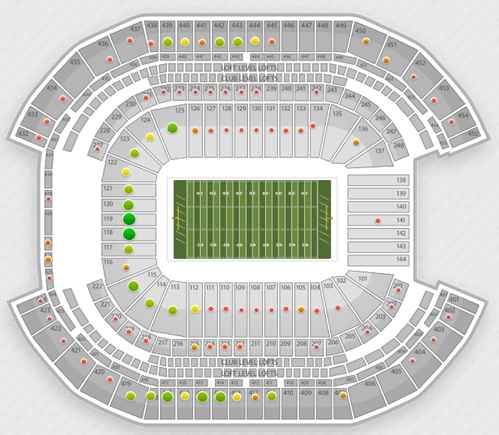 Sections 118 and 199 both have $167 ticket options in blocks as large as ten seats. 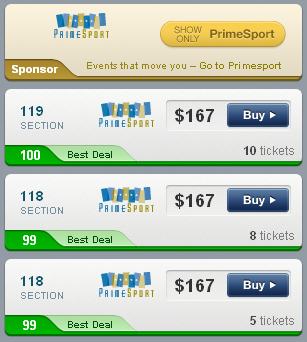 These represent the Best Deals you’ll currently find for Fiesta Bowl tickets. A number of good values still exist for folks looking to see the game closer to the 50 yard line. You can find Fiesta Bowl seats for as little as $138 (section 415) and $139 (section 411) if you’d rather be closer to mid field and in the upper deck. If you’re determined to be on the lower level AND at the 50, start your search in section 109, where 22 listings start as low as $498. That’s the cheapest ticket you’ll find to be center stage for the Fiesta Bowl. If you have any questions about buying Fiesta Bowl tickets or any finding any other Bowl Championship Series tickets, contact us on Twitter @SeatGeek or write chad@seatgeek.com. Enjoy this year’s high-powered BCS!